This article is guest posted by Robert Marchetti of Rider University and organizer of the LinkedIn Track and Field Coaches Group with over 6000+ coaches. Robert also wrote Solving the Problem of a Short Step Phase Triple Jump. This article appeared in the printed edition of FALL 2011 issue of TRACK COACH. A succinct recommendation against using higher boxes or hurdles in depth jumping where “true” jumping might not be occuring. Common practice in athletics training is the use of plyometric depth jumping. Athletes perform series of consecutive single or double-legged hopping over hurdles, or onto boxes, to develop strength levels. While some general fitness gains as well as some gains in mental focus and psychological tenacity are achieved through this type of exercise, the main benefits of depth-jumping seem to be power output, and impulse. Plyometrics train eccentric stability, the stretch reflex mechanism, and the development of elastic properties. In order to accomplish these objectives, the individual must jump aggressively between each box or hurdle. But, what hurdle or box height is the optimum? For a jump to occur, athletes launches themselves vertically, such that their center of gravity rises after take-off. This is a true jump. The higher the center of gravity is displaced vertically after a takeoff, the better the jump, the more useful the jump. Plyometric boxes come in all shapes and sizes. They range from a foot high to more than 48 inches. Hurdles can be set up to 42 inches high. However, the simple fact that five or ten 42” barriers in a row were cleared does not guarantee any quality plyometric training was accomplished. Here’s why. During depth jumping, athletes must jump far and high enough to get over each hurdle, or land on each box. Yet, without jumping very high they can flex their knees up into their chest in a mid-air tuck position, and clear a hurdle or get on top of a box that is over 42” high. One can observe a similar phenomenon during a110m high hurdles race where the hurdler’s vertical lift component is very low, yet he is able to clear barriers that are 42” high. Hurdlers manipulate their legs about their center of gravity in order to do this, but they haven’t jumped high at all. As a matter of fact, they haven’t really jumped. READ Plyometrics better than Conventional Strength Training? Take an athlete performing double-leg hop training over ten 42’ boxes. Assume his center of gravity during a standing position is approximately 40’ above the floor. 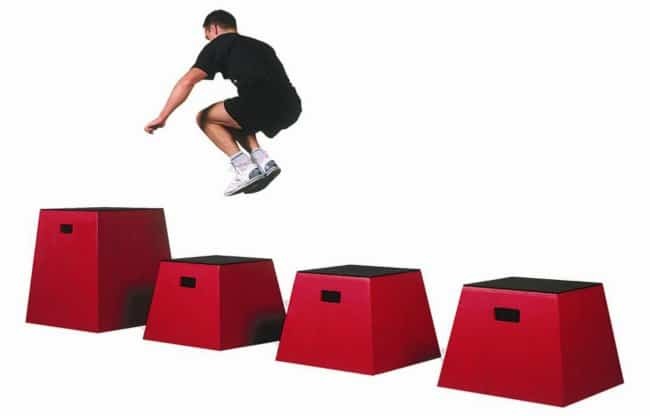 In order for him to genuinely jump between each box, he must raise his center of gravity 43” to land on top of the box without “cheating” – in other words, cheating by barely jumping up, with minimum force, and then once in the air, immediately flexing his knee and hip joint in a tuck position in order to reach both feet over the edge of each box. In that case he hardly raises his center of mass by jumping. For coaches, a telltale sign of this shortcoming can be observed when an athlete lands on the box top in a squat position, and then stands up after landing on the box. In contrast, had they actually jumped high enough, the athlete would rise vertically over the box, and would drop DOWNWARD on top of the box, nearly landing in a fully standing position. 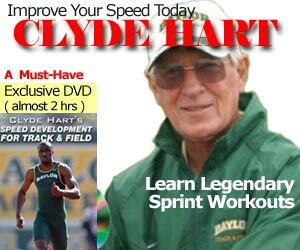 If the coach watches the athlete attempt to hop through boxes that are 42” or 48” high, and his body as a unit doesn’t rise much on each hop, then he is not really generating vertical force, and the box is too high. How many athletes can reproduce a vertical jump of 43 to 48 inches high, ten times in a row, five times in a row, or even three times in a row? How many can do this after dropping down from a box that is 42” high and rebounding up again to reach another 42” barrier? Yet taking an inventory of high school and university athletic facilities, one will discover the presence of boxes which are in excess of 42” high. It is also common to see young athletes straining to get through hurdle hops where the hurdles are set extremely high. They end up anticipating the clearance, instead of concentrating on the takeoff, when the takeoff force is what produces physical gains. If the barriers are set too high, athletes will typically land off-balance, or twist and contort their bodies into all sorts of awkward mid-air leans, or into tuck positions, in order to avoid clipping the top of the hurdles or missing the top of the boxes. Many times they fail to do either, and they end up falling. By tucking or jack-knifing the body at the hip, they’re also training the hip flexors more than the hip extensor muscles, which is the opposite of what depth-jumping should address. What exactly is the benefit of asking an athlete to go to these extremes just to say they cleared the highest boxes, or the highest hurdle? Training should be about developing strength, not demonstrating it at great risk. In addition, plyometric training done with barriers that are too high for the athlete’s capacity, causes them to neglect jump force application, in exchange for survival movements — i.e. getting over the barriers without crashing. Even if successful clearances occur, the fact remains, that a weak athlete can manage to get over high boxes or hurdles without jumping very hard. All he does is lift his knees quickly enough to get atop barriers. Taking these aspects into consideration, it would seem the best course of action would be to use lower barrier heights. Boxes in the range of 12” for single-leg hops and 24” high for double-leg hops, as well as lower hurdles set at similar levels, will permit the developing athlete to focus on the jump phase of each repetition. Even the more advanced athlete might want to use lower barriers—approximately 24” to 30” to focus on the takeoff phases. Coaches should encourage the trainee to use the hurdles or boxes as a reference point for where to jump, with the height of each box or hurdle not being the end goal in itself. This lightens anxiety associated with the risks of missing a high barrier. Another cue a coach might use as an incentive for the athlete to generate force would be to tell them just after the apex of their flight, they drop DOWNWARD a little ways onto the next box—with the legs almost fully extended under them before they land. When clearing hurdles, the vertical jump level should be sufficient to pass over the hurdle without dramatically flexing at the hips and knees. Tucking should be kept to a minimum. When these fundamentals are encouraged, the athlete realizes he/she must jump harder – producing more force. When athletes are stronger, perhaps boxes or hurdles of higher heights could be used, where true jumping still occurs, and the benefits of plyometric strength training are still being achieved. Bob Marchetti is the Assistant Coach at Rider track & field coaching staff. Previously, he was the head cross country/track & field coach last season at Belmont-Abbey College in Belmont, NC. A graduate of nearby Steinert High School, Marchetti has also coached at Columbia University, Murray State and Mercer County College, as well as the Shore Athletic Club of New Jersey. At Steinert Marchetti was a member of the 1987 Group III State Championship cross country team. Marchetti competed at the University of New Mexico, where he earned his degree in University Studies, and won the 1993 WAC title with a high jump of 7'3".